" With his fifth novel, Palahniuk steps firmly and boldly into the realm of the impossible. Lullaby is a modern·dark day fantasy featuring haunted houses, witches, dangerous spells, pagan rituals and the like. 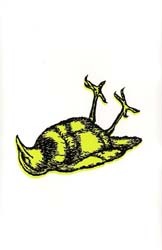 The begining of the novel is a bit clumsy, the prologue is unnecesary, and chapter 1 isn't as tight and focused as Palahniuk usually is right from page one. By from chapter 2 onwards, Lullaby is otherwise flawless : darkly and sardonic and filled with wild invention, penetrating quips, subversive ideas, and relentless energy".